The Perfect Slime For You! Are you tired of simple, one colored slime and need something a little crazy? Are you looking for the perfect DIY kit for a magical and sweet touch? Then this slime making kit is everything you've been looking for! This unique slime making kit will give you everything you could possibly ask for and so much more so you can create the slime of your dreams! It contains a wide variety of colors and designs for unique creations and endless combinations. The DIY craft supplies are of the finest quality so they can be easy to use. With these Make Your Own Slime supplies you can create the most impressive slime that will keep you and your children entertained for hours. It will also help you create one-of-a-kind decorations, such as vase or bowl fillings. ★★ Slime Supplies kits: Total 50 Pack. 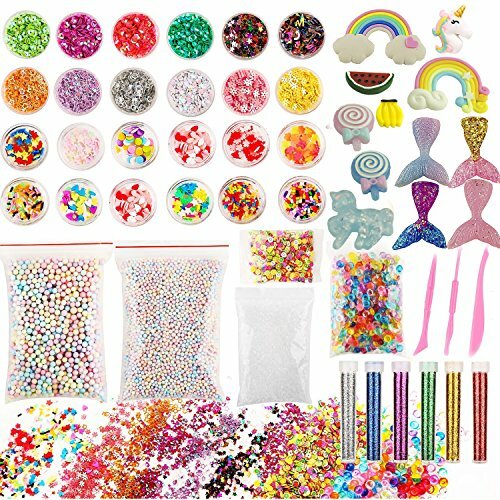 included 1 rainbow fishbowl beads, 2 rainbow slime foam balls, 30 glitter sheet jars, 1 slushie beads, 1 pack fruit slice, 3 slime mixing tools, 12 slime charms, Customize your slime according to your preferences. ★★ PREMIUM QUALITY: Every single piece of the supplies of this set is crafted to perfection for flawless results. The fishbowl beads are no burr and will not prick your hands so you can use them with ease and have amazing results every time, while the colorful foam balls will not fade for long-lasting and impressive results. ★★ COLORFUL AND SPARKLY Slime Making Set:Add variety glitter in your slime to make it different and unique. Mix it, mold it, and squish it! Add texture to your homemade slime with this slime kit. Create your own slime creation!The set also has mermaid candey pineapple rainbows slime charms, so you can add some magic to your slime! ★★DIY Slime Party: Make your own slime to relax and keep your hands occupied, organize slime making parties and activities. Slime supplies can be applied as birthday, wedding, baby shower and party decorations.The variety colorful sequins and glitter, DIY slime accessories, make party theme special and charming, and absolutely light up your children slime party. ★★BUY WITH CONFIDENCE - 48-Day Money Back Guarantee for unconditional return. 24-Month Warranty after sales. 24 Hr customer service for any inquiries. Warm Tips: Not suitable for the children under 3,only for playing, not edible. If you have any questions about this product by ANPHNIE, contact us by completing and submitting the form below. If you are looking for a specif part number, please include it with your message.